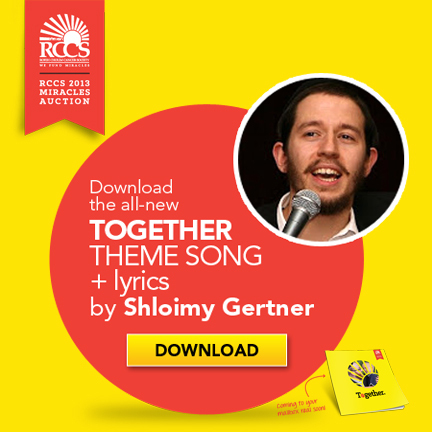 RCCS Releases New Single with Gertner in this Weeks AMI! Cancer ravages the lives of people around the world. This epidemic of epic proportions is tearing everyone apart; our people are no exception. But what is exceptional about cancer patients in our communities, is that when an individual faces the war on cancer – and the astronomical medical insurance costs necessary to fight that war – they are never, ever alone. RCCS opens its arms and joins forces with every man, woman or child in our community who is diagnosed with this tragic, life-threatening challenge. RCCS subsidizes hundreds of health insurance policies, and pursues every possible strategy when standing up to the insurance giants, so that every patient can get the absolute best medical care money can buy to fight this war. Let’s all join Together, so that we can fight cancer Together and win Together, for every cancer patient we know. Download the song by clicking image above.